Well, Zach over at ZMF has been super busy lately…hasn’t he? Not too long ago, ZMF had sent me a care package containing both the Eikon and the Auteur. In today’s publication, I’ll be detailing the Eikon. What an immense pleasure it was to listen to up to this point! The owner of ZMF is, perhaps, one of the coolest guy’s I’ve ever had the distinct honor of speaking to. Passion unbridled for his work, a raw unwillingness to fail or release a product that wasn’t what he wanted to make it to production design. He has spent years on his craft, designing and tinkering, DIYing and plucking ideas out of fictions in his mind to mold into our reality here for us to enjoy. This is a master craftsman at work and I feel like most who pick up a ZMF product are tuned into that factoid immediately. His responses are fast, even though he is monstrously busy, I am sure. And for that, as a reviewer, I am forever grateful. My Eikon came with a nice, large, foam padded hard locking case, two sets of cables (a standard ¼ and a balanced XLR), some paperwork, and of course, the Eikon itself. Your options upon checkout would be different from mine, so take a gander at the website and see what options you’d like to actually purchase for yourself. The “S3 6500” hard case is beautiful. It is the type of protection that I feel very safe with using and something I wish more companies would include with their very expensive headphones. I don’t want a cardboard box beyond a certain price point, these types of protective measures need to be included. So, I am happy to see that the protective box is very good, complete with excellent locking mechanisms and a handle for travel needs. 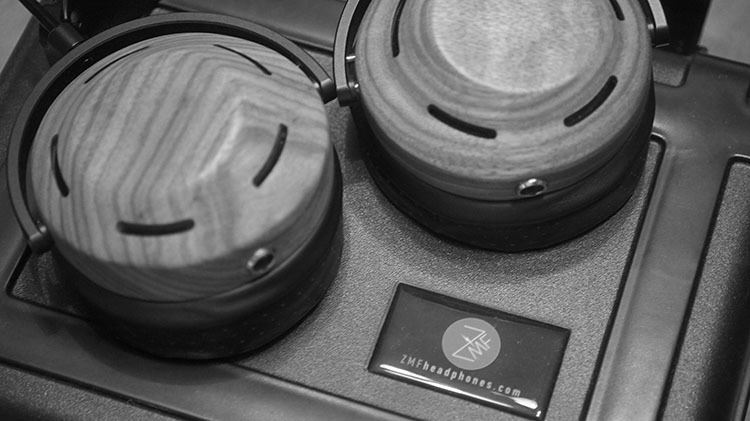 The Eikon uses Camphor wood that brandishes a hand applied varnish, as well as lambskin pads and headband material. 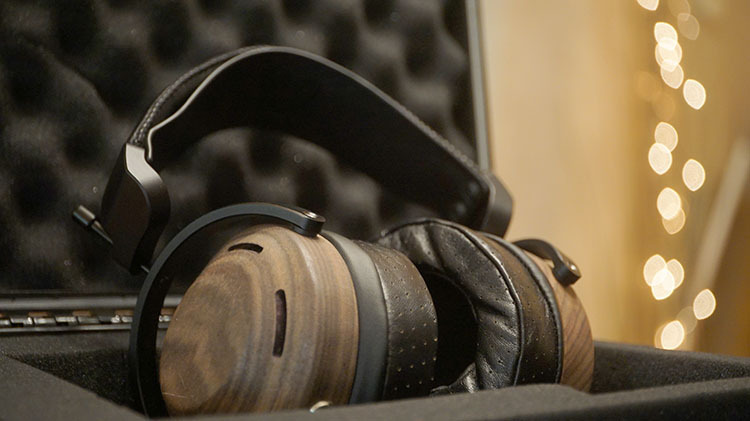 The headphone is heavy at 475g and also has a lifetime warranty on the drivers. The pads are thick and very plush, but you can swap freely with the Auteur pads as well if you prefer a totally different sound. 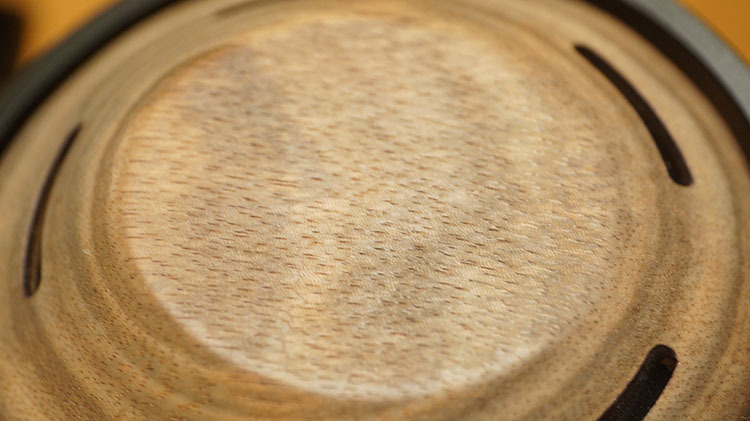 The stock pads on the Eikon are solid and not perforated, whereas the pads on the Auteur are perforated and allow more breathing room and less bass quantity. Pick up both pad sets and see which ones you like, because I’ve found that the experience will alter nicely depending on your genre currently playing or the applications you’ll be using the headphone for. 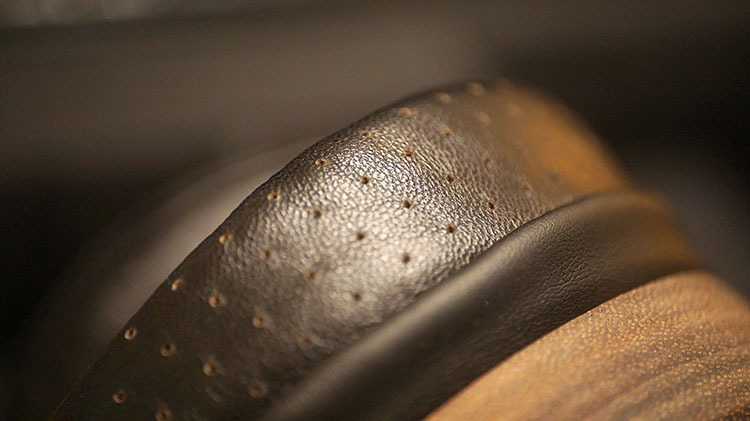 Either headphone’s pads might benefit you more and lead to a better experience for you. Personally, I prefer the stock pads because I think the Eikon is somewhat of a pure sound in tone and setup, and that the perforated pads of the Auteur end up making it sound a little too underwhelming in bass performance. Stick to the stock pads on the Eikon, IMO. Some applications sound great on one set of pads with the Eikon and lacking on the other, and vice-versa when the pads are swapped. It is all subjective preference. Both sound great, but both lend more fuel for the fire depending on what you are listening to. The headphone is 97% closed back, so says Zach himself. Also, some of the venting is purely for decoration. It does leak just a little bit of sound to the exteriors around you. Not too much, but it is there. Zach wanted the Eikon to perform on a neutral level, as advertised, but with a musical flare to it overall. I’d agree that is the case here. Substance factor, that overall heft and weight carried, is significantly thinner feeling vs the Auteur. This Eikon feels like less dense and weighted than I would like it to be. If I had a negative gripe, that would be it. But, ask yourselves how many out there love the Sennheiser HD800’s setup and feel? Do you like that type of a lightning fast decay and an overall thinner than a Planar vibe feel? Well, you’ll love this Eikon then because I felt like the HD800 and the Eikon share a similar tonality and physical presence with regard to substance factor. If you want a very dense feel, something more like a Planar in terms of that weight carried, the Auteur is for you. Grab that one instead. I do find myself feeling that the overall presence factor allotted here on the Eikon is one of a neutral flare in terms of physical quantities. In my testing, my ears picked up on a very linear feel to the entire spectrum. Equal bass, mids and treble and with a very neutral substance factor. The low end of the headphone is hyper smooth and very fast on decay. As mentioned, the headphone overall is very quick feeling, very pure feeling. Quality and overall fidelity are excellent, no doubt there. But, I am finding it relatively poor in EQ potential for the price. It just doesn’t want to respond well to EQ alterations and boosting when I toggle some in via my sources. It isn’t at all a deal breaker, but it is noteworthy and gets stressful when I want a lot more bass or treble out of it and I am not able to achieve it. In terms of responsiveness to EQ, the Eikon is not so good at it. This headphone is for linear enthusiasts and in my opinion, not those who want to boost and use EQ often. Quantity is also on the low end of moderate. Meaning, it is not for bass heads. The physical quantity, on a flat EQ, is just fine though, not too much, not emaciated or underperforming. As mentioned, the only issue I have is that I can’t boost it much at all to achieve more quantity and that bugs me. Added power via a great amp, like my Feliks Audio Euphoria, does not benefit the headphone beyond overall quality and fidelity. The headphone seems to perform the same on portable sources with a typical amount of power to drive the headphone normally, vs the much more powerful desktop amps. Bass doesn’t seem to increase in heft on a flat EQ band with a lot more power, so that is a good thing. Those who have great portable sources will really enjoy that and not have to worry that they’ll need 2+ watts to achieve good things out of it. It isn’t that I don’t like neutral or natural sound, it is just that I subjectively think that if you are going the linear, fast decay route, something should be jumping out at you, grabbing and enticing you with its embrace. The Eikon is very linear feeling and the midrange feels very flat as a result, that is, with regard to sitting in the middle of the bass and treble areas. Quality is sublime, at least in my opinion and the tonal hue offered here, that natural flare of it all, is immensely realistic at times. After listening for many hours, my ears never adjusted to the very fast decay and the natural appeal, but that is because I am a music enthusiast and on a subjective level, I enjoy boosting and thickness more than the type of sound offered here on the Eikon. Musical chasers like myself will not be at home here, but those who like the linear feel to the listening experience will be extremely happy. Realism and coherency are off the chart good and actually better than the Auteur, at least in my opinion. Voices come out of a natural feeling void and background and can be well defined in size and shape, due to that excellent decay factor. Voices feel round, shapely and in their own space. 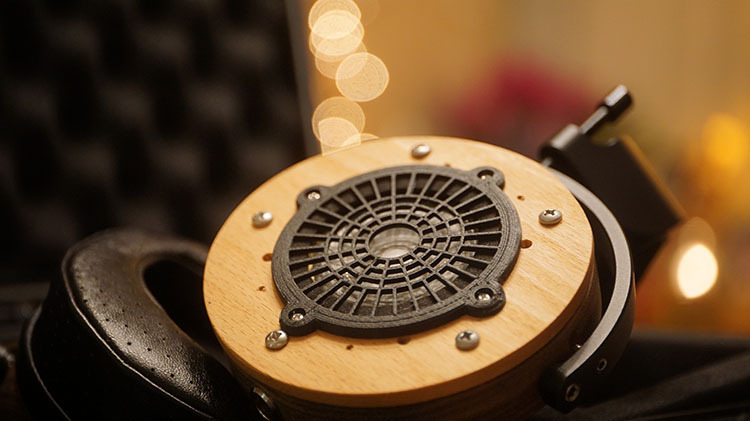 Not many headphones do this, the Beyerdynamic T1 did it and so did the HD800. I’m happy to say that I think the Eikon is also on that list of excellent coherency and well setup physical presence in terms of midrange vocal experiences. 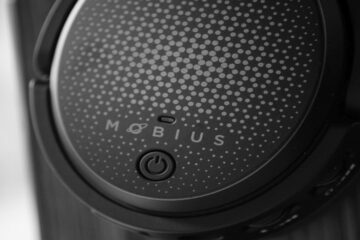 Excellent vocal headphone, but not one for those who like a very forward midrange that pops beyond the bass and treble. If you are into relaxing and chilling out, this is the better option for you. I commend Zach here vividly because this headphone could have easily made the same mistake that many other neutral headphones make when the bass and midrange are very linear feeling: a boosted treble. Thank the audio deities that he hand and ear tuned this to his liking and did not jump overboard with treble quantity. The Eikon is, once again, very linear feeling and the treble response is smooth and fast. It has a very good engaging factor that maintains a solid kick and slam effect, but one that is not really ever annoying or painful in the slightest. It has some engaging factor to it, but it is still within the boundaries of what I’d call smooth on physical impact. Overall Fidelity is good, but not fantastic. There are other sets out there with superior treble response in this price tier, but with that in mind, I can’t really name more than one that I would call smooth. 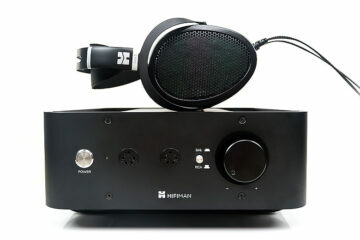 The Hifiman HE-6 is perhaps the only Treble enthusiast headphone sub $1500 I can even think of that performs on grandmaster level, a headphone with excellent treble bite and style, but also beautiful tonality and quantity. The Eikon feels more like an Audeze in that regard. Quantity is just good, it doesn’t bite and doesn’t ever get piercing, but it also doesn’t feel sparkled or tonally boosted. If you like a flat treble, this is for you. I don’t feel like the Eikon is lacking in the slightest in the staging department. What is there, is once again, very coherent and well executed. Realism factor, due to the excellent midrange, only boosts the potential depth and realism factor of the physical presence of the entire experience as a whole. Stage width is the only real issue here, as I don’t find it particularly wide at all. Height and depth of field, that cavernous feel, are both very nice. This headphone does not lack in imaging, as I’ve found that instruments and vocals alike sound very well formed. Sure, there are better sets out there for it, but I circle back again to the coherency factor that is so very well tailored. Fast decay and coherency combined usually equate to excellent mid-band appeal, excellently shaped and well-formed structures in the void and so on. The actual defined lines of the instrument are much more noticeable here than the Auteur for example, which is a very meaty, thicker and lush sound than this Eikon. The background doesn’t feel like it is there sometimes, which is a great thing. I don’t detect noise, nor any of that typical jet black appeal that darker headphones have. This headphone isn’t dark, it is also very fast on decay and natural in tone. So all of those qualities combined results in a sum of imaging factor and background that feels very, very natural. I am comparing a closed back in the Eikon to the Auteur that is open and actually feeling that the purity factor of the Eikon allows for a more well-formed and coherent experience, which in turn forces more stage depth of field factor in the Eikon by a small amount. Hell of a headphone. The decay factor is off the chart great and the natural and neutral appeal in tonality is very good. The headphone is plenty clean and clear for the price, at least in my opinion. I’d like it to have had more response to EQ though. Truly, that is my only actual objective gripe. The Eikon is a natural/neutral sleeping giant that is intended for a quick responsiveness to everything, top to bottom. It doesn’t hit hard, but it doesn’t at all sound boring in kick and slam factor (physical dynamics) and I am very happy to report that the headphone itself is simply breathtaking to hold and experience in the hand. This is a piece of art that also sounds great. 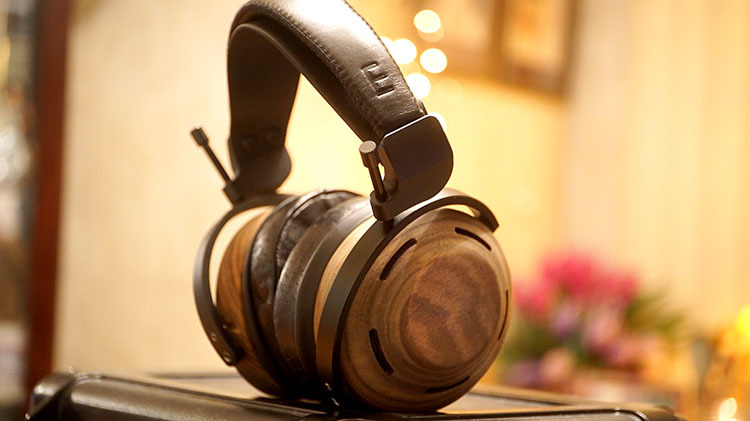 If you know me, you know I am highly respective of handcrafted art, especially with wood, that goes into headphone design. This headphone makes me happy both when I listen to it and when I simply observe it sitting on my headphone stand in my media room. At the end of the day, the Eikon sounds great, looks great and feels great. It performs very well and is set up for a flat EQ line, most of the time. If you like a natural tonality that isn’t overly clinical or cold at all, but also one that isn’t very warm, something with a very good coherency factor that makes vocals and the center image instrument in the track seem lifelike and very well formed, then I suggest you pick this up asap. Zach does great work. This headphone is intended for you to enjoy music and not critique it too much. There are many ways to enjoy music, just a few being through a natural sense of tonality and a linear feel with a lightning fast decay, and also, something moderately warm, something highly exaggerating and very deep reaching in bass with the right pad set. The latter of those statements pertains to the Auteur with the Eikon pads…can’t wait to start penning that review! The Eikon and Auteur are completely different beasts. Yet, both are stunning in their own ways. I have had a bit of a hard time reading this review. I was more than once wondering if we have been listening to the same headphone, so different are your impressions from my own. Also, contrary to your observations, I feel the Eikons are quite amplifier sensitive and it is worth checking out synergetic pairings. They are more than decent with portable devices, but really scale with a more powerful amp. I don´t think I could overhear the improvements going from most Daps to my SS Soekris dac1541 balanced. The Eikons also do very well with quite a lot of tube amps. In fact, we shoud not forget these are 300 Ohm nominal, so a little higher Zout does not harm. On my Trafomatic Head 2 they gain a very addictive musical fullness without becoming more loose or dark, and this has been my preferred combination. I will get the Auteurs next week and I don´t expect them to sound like you descibe them in comparison to the Eikons. From friends I have come to trust for their evaluations, I actually expect them to be more neutral and with even better imaging qualities and improved soundstage (which is to be expected from an open implementation of the same driver). I hope you will be reviewing the Auteur with the Auteur pads. Pads do change the sound signature quite a bit. When different pads from the standard are being used it should be clearly indicated as this could easily account for impressions which are out of line with impressions I have read elsewhere. The Eikon stock pads don´t make sense on the Auteur as far as I know and I´ve never read this combination to be recommended by Zach himself (ZMF does offer perforated Eikon pads however, and these can be used on the Auteur for a slightly different sound signature).